The latest tech topic du jour seems to be Facebook’s reach to justify a $77 billion market cap — down from its $82 billion IPO valuation. The social network’s migration to mobile — to the tune of half a billion monthly active users — is the biggest source of investor concern. As users spend more time accessing the service from a touchpoint that is under-monetized, its average revenue per user (ARPU), goes down. Yelp faces a similar situation: about 10 percent of its monthly uniques access the site via mobile. But they represent a disproportionately large 40 percent of overall search volume. Yelp also told me that it generates a phone call or directions to local businesses via mobile every second. These numbers say a lot about how engaged mobile users are, and indicates the real the revenue opportunity once Yelp more comprehensively flips the monetization switch. This is especially relevant given “lower funnel” actions like calls and directions — tangible conversions that typically resonate with local businesses. But perhaps equal to the opportunity for mobile monetization is its necessity. Similar to Facebook’s challenge, as more usage flocks to a distribution point that’s under-monetized, ARPU presumably goes down. Even companies that are beginning to monetize mobile aren’t seeing ad revenue comparable to desktop (except Twitter). 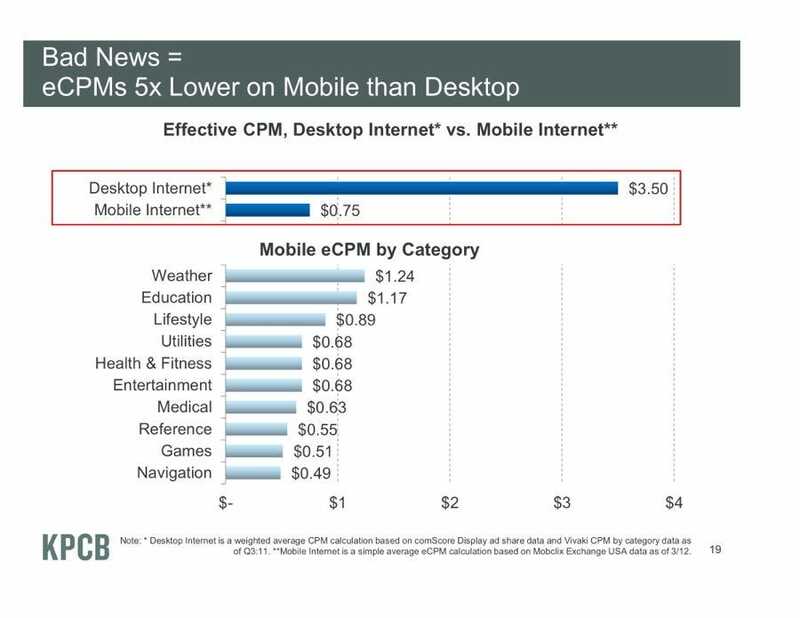 Mary Meeker’s semi-annual data dump during last month’s D10 conference confirmed that mobile eCPMs are 5x lower than the desktop. This is similar to mobile forecast data I’ve generated, indicating that mobile ad rates remain lower — but performance (such as CTRs) is typically higher. That’s bad for publishers, but great for advertisers who can experiment in early stages with this undervalued ad inventory. But the reason for these lower ad rates is pretty simple: there is currently an oversupply of ad inventory that doesn’t yet match advertiser demand. 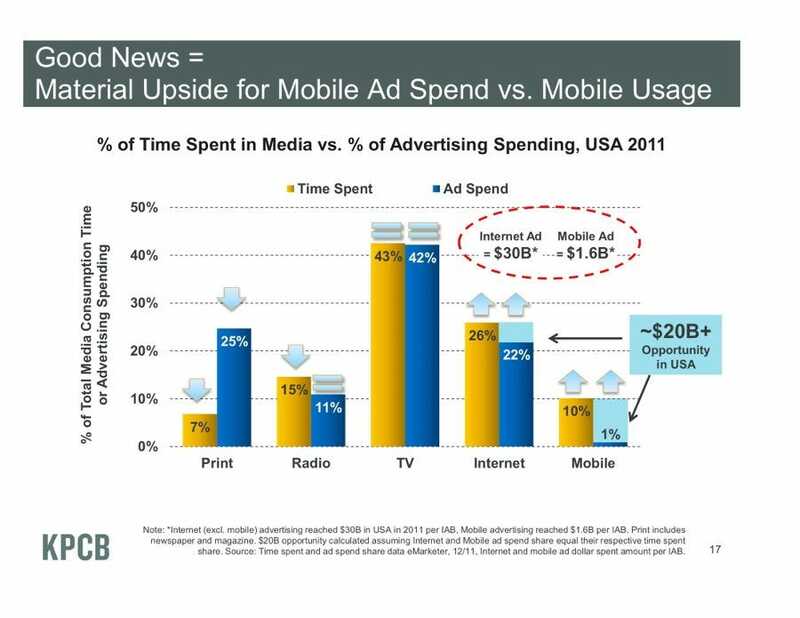 This is further supported by Meeker’s familiar slide that mobile represents 10% of a user’s time, but only 1% of media ad spend. This is scary for mobile developers and publishers because oversupply of ad inventory could lead to the kind of runaway commoditization of display ads that developed on desktop over the past decade. The result: tanking CPMs. So how do we avoid that in mobile? One way is the natural move towards equilibrium, where advertiser demand picks up to catch up with supply. That’s speculative, but I believe it will happen as advertisers evolve and start to understand mobile’s reach and performance benefits. The other way is through greater sources of premium ad inventory. One example is Facebook’s Sponsored Stories, which carry social relevance and organic generation. That’s already bearing out in performance metrics compared with traditional banner ads (especially on mobile). The other example of premium inventory will be local, where we’re already seeing performance deltas. Location-targeted mobile ads typically see a 3x-9x click through rate (CTR) over non-localized equivalents, according to a panel at Street Fight Summit West last week. And it’s not just CTRs, but the all-important secondary actions (calls, directions, etc.) where local advertisers place value. Taking it a step further, mobile payments will really unlock value in mobile ads by closing the loop to the cash register — an entirely separate column. So how will all of this come about? Successful mobile campaigns won’t just mimic their desktop forbears for lots of reasons we’ve been over, including the “mobile first” mentality of native development. GPS, touch, and local user intent will be key factors to build campaigns around. Models we’re seeing so far include pay-per-call (it is after all, a phone); as well as the development, optimization and hosting of SMB mobile websites – a hugely untapped area. Dashboards to manage social presence and customer loyalty programs (i.e. mobile deals), will also be huge. And the beauty of mobile – being its own unique form factor – is that new ad units and delivery methods will emerge. We’ll see more of this mobile-first thinking such as Facebook’s Sponsored Stories — and other things no one has even thought of yet. Keep an eye on Yelp and Foursquare especially. Mike Boland is senior analyst at BIA/Kelsey, where he heads up the firm’s mobile local coverage. Previously, he was a tech journalist for Forbes, Red Herring, Business 2.0 and others. He will host BIA/Kelsey’s upcoming Mobile Local Media conference, which is taking place on June 27th in San Francisco.